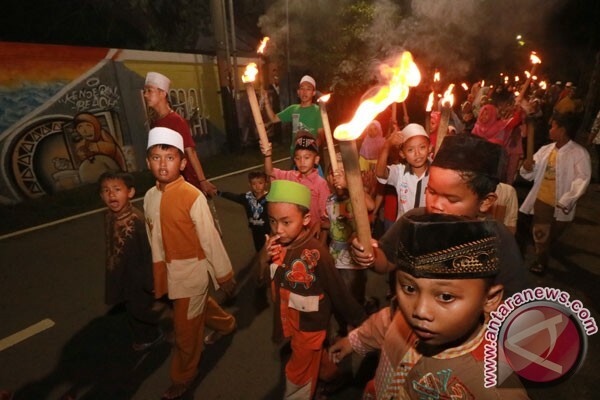 Muslims in Indonesia seem to be in a festive mood of Eid al Fitr, better known as Idul Fitri or Lebaran celebration. The aura of the holiday spirit can now be felt in the Greater Jakarta areas where the normally congested streets are pleasantly deserted, and one can actually take a deep breath without inhaling a lungful of pollution. Muslims in Indonesia, who account for nearly 90 percent of the countrys population, are celebrating Lebaran on July 25-26 this year. During this time, the capital city of Jakarta reveals itself as a friendly city, with wide, tree-lined avenues where pedestrians can stroll on the pavements without the risk of being hit by a motorbike. The prevailing custom of Lebaran in Indonesia is one of the largest temporary human migrations observed globally when workers return to their hometowns to celebrate with their families and relatives and to seek forgiveness from parents, in-laws, and other elders. Such a mass exodus, or homecoming, is known in Indonesia as "mudik," which is an annual tradition wherein the people living in major cities, such as Greater Jakarta, Bandung, Surabaya, and elsewhere, travel to their hometowns to meet their relatives. Early on Sunday morning, mosques in Jakarta and elsewhere were packed with thousands of worshipers performing Eid al Fitr prayers and then listen to sermons, focused on unity and integrity, goodness, social spirit, and many more positive things. The Idul Fitri prayer service at the Istiqlal mosque in Jakarta was started at 7 am on Sunday with the presence of President Joko Widodo (Jokowi), Vice President Jusuf Kalla, and other state officials. Also present at the Idul Fitri prayer service at Southeast Asias largest mosque with the capacity of 120,000 people were also thousands of Muslims from all corners of the state capital city of Jakarta. In his Idul Fitri sermon at Jakartas Istiqlal moaque, Prof. Quraish Shihab preached on "Idul Fitri and the Spirit of Strengthening the Unity and Integrity." Quraish Shihab gave some advice on unity for Muslims both as individuals and in society. "The unity of the human self consists of the spirit and the body. The unification of the soul and body makes the man intact so that there is no separation between faith and practice, neither feeling nor behavior, deeds with morality, idealism with reality, and these are all complementary parts," Shihab remarked. In the meantime, Peoples Consultative Assembly (MPR) Vice Chairman Hidayat Nur Wahid in his Idul Fitri sermon at Nurul Hidayah Grand Moaque in Bintaro, South Jakarta, said all the goodness during the holy month of Ramadan must continue to be practiced, although the fasting month has ended.